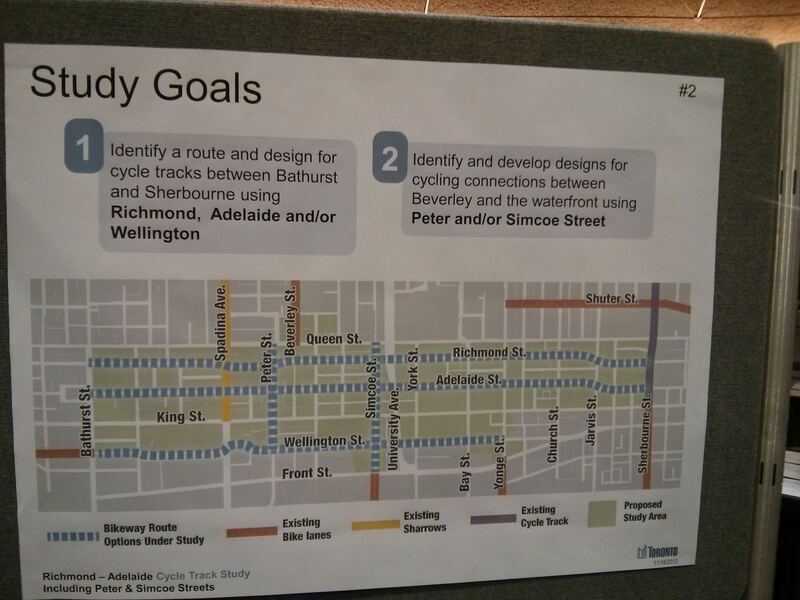 Suggestions and annotations from the public are added to a map of the Richmond and Adelaide cycle track proposal at yesterday's Metro Hall open house and public consulatation. 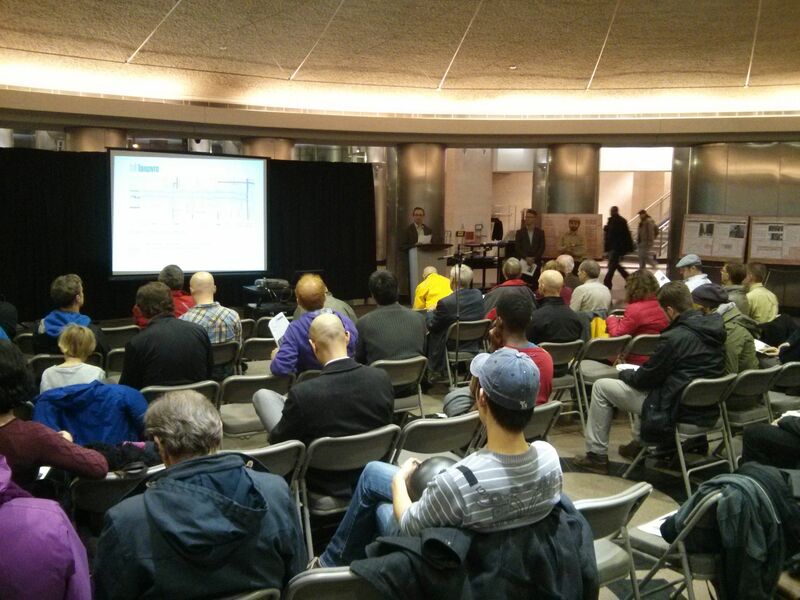 On November 18, 2013, approximately 40 people gathered in the Metro Hall rotunda to browse plans and review images for the proposed cycle tracks for Richmond and Adelaide streets, and hear a short presentation on recent developments by City staff. The Richmond-Adelaide Cycle Track Study is looking at the area between Bathurst and Sherbourne from Wellington north to Queen for the installation of networked east and west cycling infrastructure. 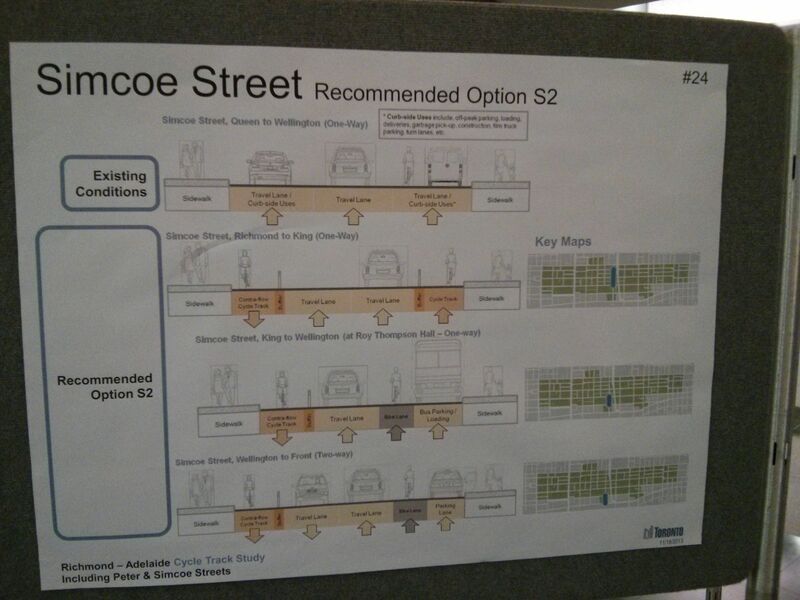 New treatments for the north-south routes along Simcoe and Peter streets are also under consideration. The meeting was the second public consultation forum of a study that is currently in it's second phase. City of Toronto information on the project can be viewed here. The projected timeline for the study will have the completion of phase 3 by 2014, and if all goes well, we could see implementation in 2015. However there may be a pilot project rolled out as early as next summer. Certainly, local stakeholders are asking that the project come to fruition sooner than later. Safety is a major concern for one local school. Lee says they’ve tried various routes and permutations in trying to get to school (parent on the street, kids on the sidewalk, all on the street, taking alleys instead of main roads etc.) 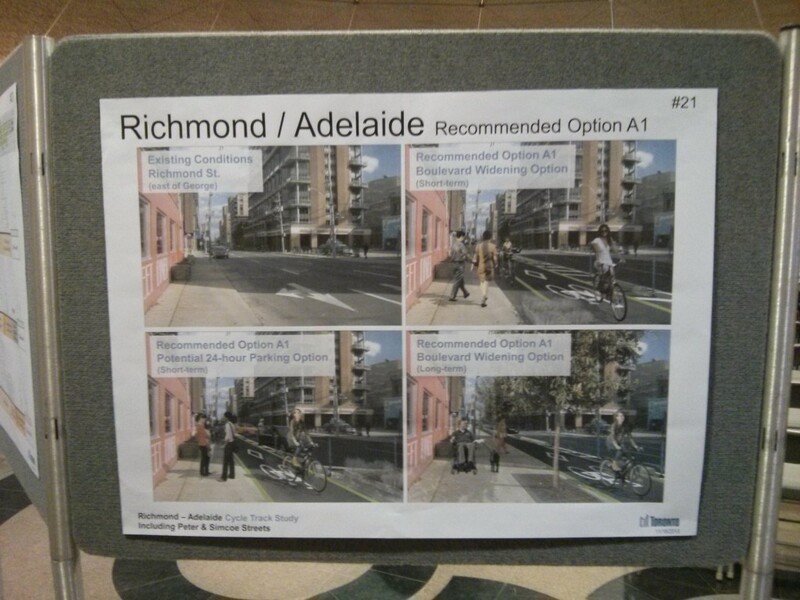 “I am hopeful that having separated cycle tracks on both Adelaide and Richmond will provide better protection for both cyclists and cars,” says Lee. Emily Chan, a parent and teacher at the ALPHA Alternative School is in support of the Richmond and Adelaide cycle tracks. “For years, our students have clung to the school fence facing Adelaide St. West in awe of how fast traffic moves. Two years ago, there was a pedestrian fatality at the intersection of Adelaide and Brant that made a huge impact on our students. We wrote to our local city councillor to ask to reduce speeds in the school zone,” says Chan. At the meeting traffic planners reported back on what's developed since the first public consultation earlier this year. 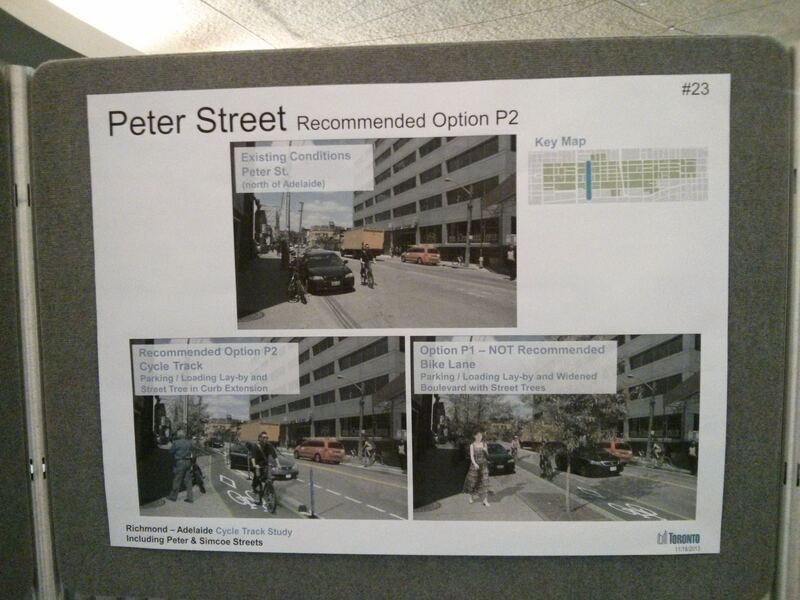 We were told that some of the options previously under consideration, including converting Richmond and Adelaide to two-way streets, or placing a bi-directional lane on just Richmond or Adelaide, have largely been ruled out, with uni-directional cycle tracks on the right side of both streets being the preferred option. Richmond and Adelaide are currently four lanes wide in most stretches (except in those areas where new condos are being built). 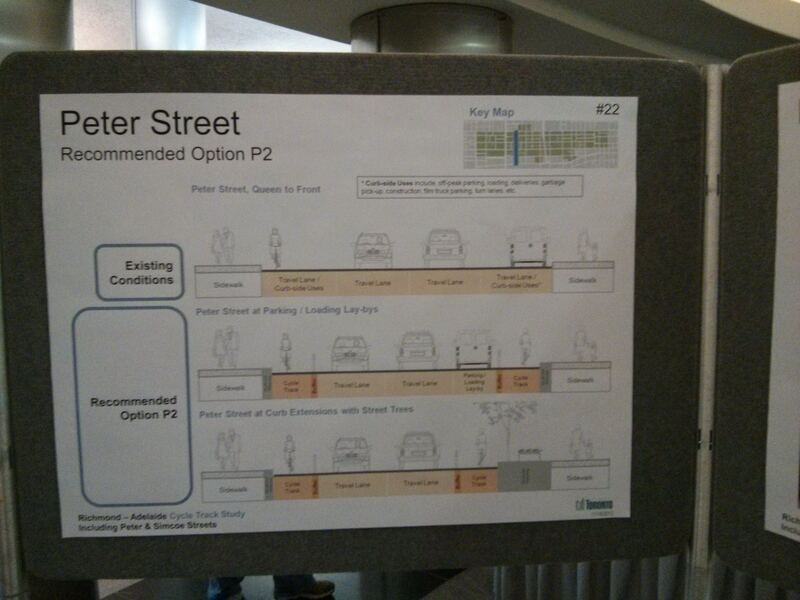 The cycle track proposal will reduce this to three lanes for motor vehicles, and one lane for bicycles. 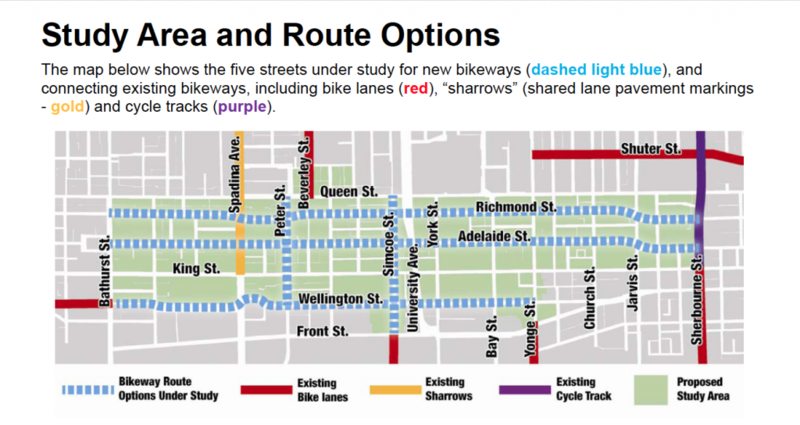 Widths will vary slightly throughout the corridor but generally the bike lane would be at least 2.2 metres wide, with a buffer of at least 0.7 metres (but up to 1.5 metres wide in some places). 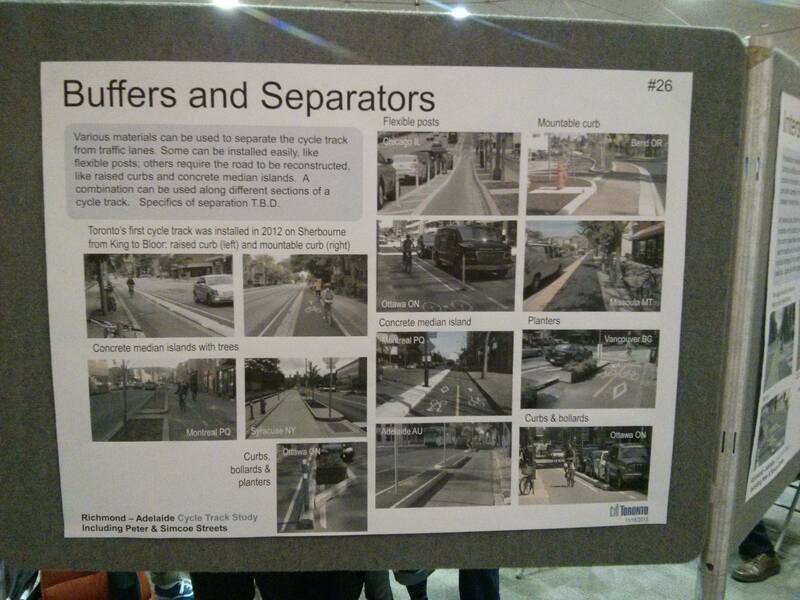 Treatments of the buffer space are still under consideration, but could include bollards, concrete parking curbs, and/or planters. During a lively question period about a dozen people voiced concerns. 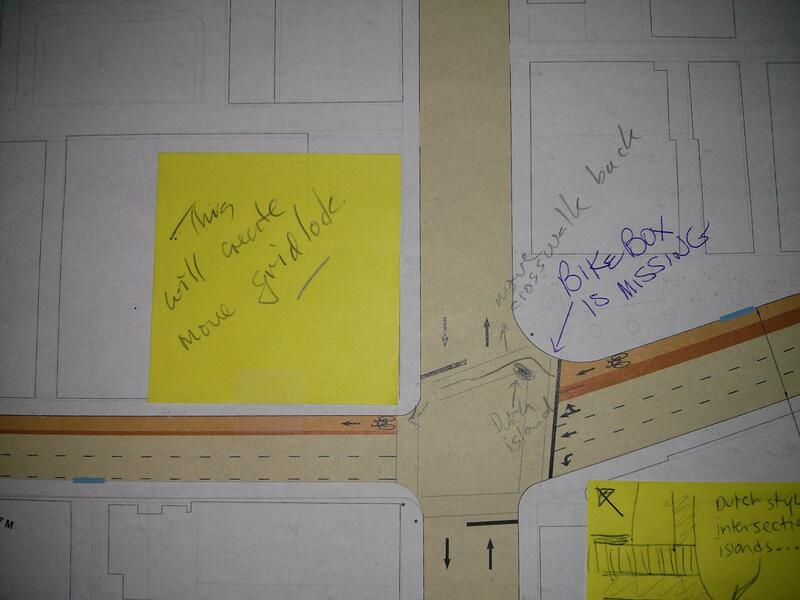 Many wanted assurances that there would be connectivity with the broader downtown patchwork of cycle routes. The planners responded that they are exploring options to maximize connectivity, such as with Shuter in the east, Beverley/St. George in the north, and possibly extending connections west of Bathurst towards Shaw where we have a new contraflow lane. There was only one speaker vocally opposed to what he saw as the potential for increased traffic and congestion due to the removal of one motor vehicle lane. City planners responded that new infrastructure to the study area would actually help to “clean up” the corridor, and bring more functionality to thoroughfares that are currently not optimized. Overall, there is a need to improve road safety in an area that has seen a 300% increase in population since 1996. 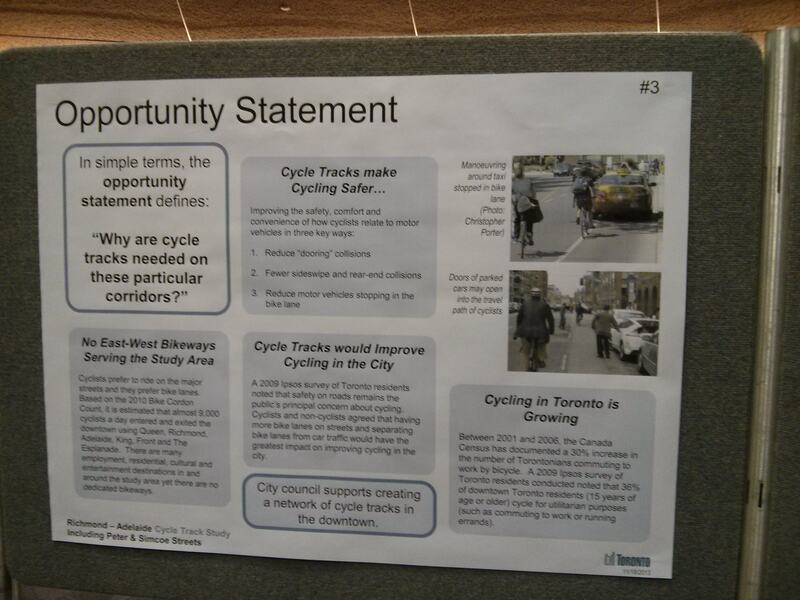 Many cyclists already use the streets to reach destinations through and within the study area. Many stakeholders in the area are registering their opinions with the city, and you can too. Simply email: CyclingRichmondAdelaide@toronto.ca or go to this webpage to find out more about how you can have your voice heard. Here is the latest version of the stakeholder pdf report.